Women vegetable farmers in Muzaffarpur, India, benefit from collective marketing, cutting out the middlemen and putting more money back into their businesses and families. Asha Devi and her husband, Ganesh Kumar Singh, lease out part of their home as a collection cener for community vegetable farmers. At 7 o’clock in the morning, there’s a steady stream of farmers arriving with headloads of vegetables at the collection center in Machahi village, in the Muzaffarpur district of India’s Bihar state. It’s late autumn, and there’s a nip in the air, but these farmers have already been up for a couple of hours, harvesting the day’s produce in the fields at the break of dawn and then walking 4 to 5 miles to the center. Baskets of okra, cauliflower, gourds, radishes, potatoes, tomatoes, eggplant, spinach and coriander leaves are dropped off for sorting and grading. For Asha Devi, 23, it’s another busy morning, fixing breakfast for the family, getting her 5-year-old son Ankit, ready for school, while her 3-year-old daughter Ankita Rani runs around. Asha and her husband, Ganesh Kumar Singh, have leased out the front portion of their residence to accommodate the collection center, and they run it together. Ganesh, who also operates a bicycle repair shop, helps out with the cleaning of the premises early in the morning and arranges the weighing machine, vegetable crates and other paraphernalia for the day’s business. 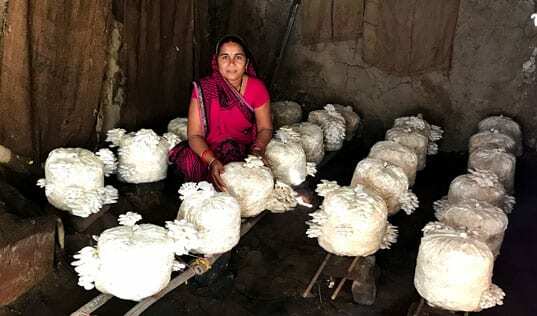 As a vegetable farmer herself and a member of an all-women producer group, Asha Devi has seen her life transformed in just a couple of months. She is at the hub of a novel supply chain initiative that links female fruit and vegetable farmers to markets. Through collective marketing, participating farmers are able to increase their profits, which can then be invested in high-value crops that further increase profit margins. 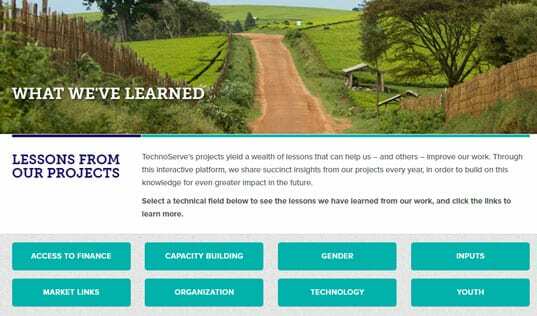 TechnoServe, with funding from the Bill & Melinda Gates Foundation (BMGF), are implementing the Women Economic Empowerment project in collaboration with the Government of Bihar’s JEEViKA program. The project is providing technical assistance to the producer groups (PG) and developing a multi-year roadmap to facilitate PG formation in the state of Bihar. Supported by the World Bank, JEEViKA aims to alleviate poverty in rural Bihar through value chain-based livelihood interventions and the support of community-based organizations. The project is helping smallholder producers achieve higher prices and direct market access by removing intermediaries and adopting best practices, including collective marketing, quality control, and transparency in weighing and pricing. The team has worked to strengthen the all-women Samarpan Jeevika Mahila Kisan Producer Company Limited (SJMKPCL), a farmer producer organization (FPO) comprised of smaller producer groups, transparently leveraging their aggregation advantage. The operation at the Machahi collection center, established in August 2016, is managed by community members under the guidance of SJMKPCL. Asha and other members were trained in sorting and grading practices by the TechnoServe in order to ensure that produce meets quality parameters. By increasing transparency in weighing and grading their products, producer group members can meet quality standards and raise the prices of their crops. In 2016 Muzaffarpur district was chosen as the site for this pilot project due to its long-established reputation as a vegetable growing region supplying to major markets in eastern India. SJMKPCL is able to sell fresh fruits and vegetables to the Big Bazaar Retail Store as well as institutional buyers in Muzaffarpur. Over a five-month period, more than 30 metric tons of fruits and vegetables, valued at $9,700, were sold to various buyers. The members of the producer company are enthusiastic about the results. They are seeing better prices compared to the traditional model of selling to village-level intermediaries. By the end of January 2017, 122 members of 15 producer groups across six villages directly benefited from this initiative, experiencing a 9 percent increase in income in addition to sharing in SJMKPCL’s profits. 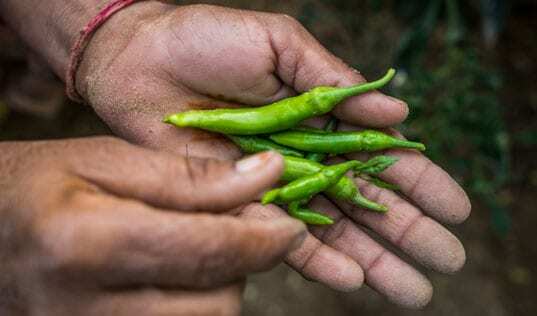 After their initial successes, the community is now planning to grow more lucrative, non-traditional vegetables under guidance from the JEEViKA and TechnoServe teams. After being processed at the collection center, produce is sent to various retailers. In a five-month period members of the pilot program sold $9,700 of vegetables directly to buyers. Timely payment and cashless transactions are a key benefit of the intervention. Women farmer members receive payments through digital transfers directly into their individual bank accounts. This direct payment gives them more control over their finances, and research has shown that when money ends up in the pockets of women, more of it is invested back into family health and wellbeing. Back at the collection center, farmers' deliveries are weighed, packed and loaded onto small transport vehicles that quickly dispatch them to their destinations. By 9 a.m. it’s a wrap – all in a day’s work.